must have item | preciousandmakeup.org || it's just a beauty thing. Hey everyone! It’s been awhile hasn’t it? I’ve just been so busy and I neglected my poor site! Artistry Essentials Colour Quad in Medium – I use this basically everyday now if I want to achieve a more neutral look for business meetings. These mineral eyeshadows go on like BUTTER. They blend so beautifully! What I especially like about this quad is the fact it comes with a cheek color as well as liner color. Talk about convenience! I can even use the darkest eyeshadow color for a brow color. An amazing buy for $25. I’m stocking up on these quads because they are the perfect eyeshadow colors for brides/bridesmaids (aka WEDDING SEASON!). Artistry Essentials Mascara – If you know me, I’m all about lashes. Since I have barely there lashes, mascara is always a must with me. I finally got to try Artistry Essentials’ and I have to say that it’s a new favorite of mine. I’ve tried a lot of mascaras, but for me, Artistry makes the best mascaras. This mascara provides a clump-free look that enhances, lengthens, separates every lash. I’m the type of girl that puts on about 42649284 layers of mascara to achieve the look I want, but with this mascara, a few swipes on the lashes and I’m satisfied. Why spend $20+ for mascara when you can spend only $14 for this must have essentials item. NAO Cosmetics blush in Smitten– I bought this color by accident! I meant to order Epic which is a matte blush. Smitten in the pan, looked kind of scary to me at first glance. I was reluctant to even try it and was about to return it. I thought to myself ‘how is this shimmery melon color going to look good on my skintone?’. I finally tried it out and it’s one my of favorite blush colors ever. I was amazed on how this color adjusted to my skintone so well. It wasn’t as bright as it was in the pan. The staying power of NAO’s blushes are great. By the end of the day, my cheek color was still there. NAO’s blushes are nice in texture and the shimmery-ness of the blush wasn’t too over-whelming. On ‘lazy make up days‘, I like to apply Smitten on my eyelids (without a base so, the color isn’t to bright), apply a brown eyeliner to my upper lashline (I like to use a brown eyeshadow applied with a dampen thin liner brush for a more softer eyeliner look than regular pencil eyeliner), and a few coats of mascara. This highly pigmented blush will set you back only $19.55 and it’s worth every penny. NAO Highlighter in Dark – No women in the world should be without this product! Talk about miracle in a tube. This creamy textured highlighter will make up look refreshed and adds a certain glow to your appearance (yes, it will even make you look good on a Monday morning!). This product is a everyday must for me. My clients rave over this stuff, they just can’t get enough. A few dabs of this underneath your eyes, tear duct, browbone and your good to go. I also like to apply a strip of this highlighter on the bridge of my nose and blend it a little. I noticed how my nose appeared slimmer in size. You can also use this highlighter as a concealer. Have a problem with feathering lip color? Apply some of this before applying your lip color to minimize feathering. I think if this product was $100 I would still buy it, but lucky for us it’s $16.45. Stock up on NAO Cosmetics because soon NAO will be no more. This truly saddens me because they provide make up artist quality products for only fraction of the price. Sad to see you go NAO! 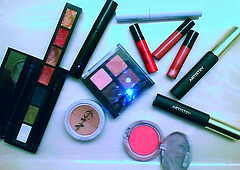 Expect new things for Precious & Make Up! New layout, domain name, content, the works..just keep checking! You are currently browsing the archives for the must have item category.